Ever wake-up in the morning and feel like you have nothing to wear? Well, if you have a pair of black pants and a black top, you can cobble this look together! This all-black, simplistic look is so easy, warm and comfortable. I took some cues from classic French style to put this together. 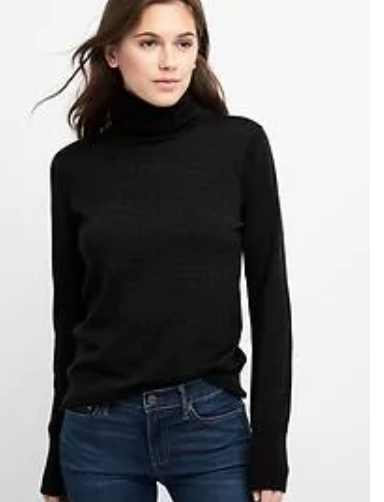 I wore leggings with this sweater because it was the weekend (I also pretty much just live in black leggings) but if you were to wear this to work, you could easily switch out the leggings for a pair of black pants! The basics: Black turtleneck (or you could use any black top really) and black pants. A neutral accessory to add contrast. In this look I achieved that with my black and brown leather cross-body. You just want to have something to break up the black. You could also do this by wearing a tan or light colored trench coat or jacket as well. Black shoes. I wore heels because, I just love heels! But if you’re a flats type of gal, then I would suggest a pair of black loafers (like these). Red lipstick. Since this look is mostly black and neutrals, a great way to add a pop of color is through your make-up! I am a big fan of red lipstick which also works with the whole French vibe I was going for. If you need some recommendations on red lipstick, check out my favorite reds here. In this photo, I’m wearing a new one from CoverGirl. I love these black pants for work!